This year I started dietetics. But, what even is ‘dietetics’ anyways? What do dietitians do? Do we simply look good in lab coats with fruit on our desks? Dietitians are the experts in food and nutrition (you can read about it here). I made the exciting transition at the beginning of the year from Nutrition Science to specialised study in Nutrition and Dietetics. So dietetics is… ? Vegetarians: what nutrients could you be missing out on? When you remove any food from your diet, you’re at risk of nutrient deficiency. When you remove meat from your diet, you may not only be low in protein, but many other nutrients too. Ethical reasons aside, there are many health benefits to the vegetarian diet – but I’ve always wondered what exactly makes a vegetarian diet healthy. There are different vegetarians but overall there are key nutrients to pay attention to. These include iron, B12 and a few others. As a student dietitian, I get my fair share of nutrition questions. I’m still learning and there are many things I don’t know (or don’t feel confident) enough to answer straight away. After all, we’re meant to be the ones to provide evidence-based information. Giving the wrong information can be dangerous and as students we shouldn’t be adding to the misinformation. Out of a desire for correct knowledge and curiosity (this was one of the reasons I started this blog), I’ll look for the answer to these questions. Over the past few years, I’ve come up with a list of my go-to-resources for information. You’ve decided you want to eat healthy and go back to basics. Ultimately, nutrients are all you need. But what are nutrients, what are RDIs and how do they all relate to my health? There’s protein, carbohydrates, fats and fibre. Then all the vitamins – vitamin A, B group vitamins, vitamin C, vitamin D and a few others. What about minerals – are you getting the right amount of calcium, magnesium, sodium, potassium or selenium? There are recommendations – but that’s a lot to keep track of. What about individual variation? You might be tall or short, active or inactive, eat three large meals a day or have small meals and snacks continuously throughout the day. You want to shed a few kilos. You want to run for the bus without a bright red face. You may feel guilty after the greasy feeling of finishing a bucket of fried chicken. You may want to eat healthy, perhaps trying to eat from the different food groups. Celebrating a Year of What About Health? Celebrations are wonderful! There are gifts, speeches about the past year, and there’s always cake. So here we are at the first birthday party of “What About Health?”. I can’t believe it’s been a whole year already since I started this crazy journey. The WAH? Community has grown, there have been many questions asked, nutrition conversations, and a lot of food for thought. Just like any good party, this birthday celebration wouldn’t be complete without reflection speeches, thank you’s and of course, gifts and cake. The health food aisle in the supermarket can be overwhelming. Do you really need all those organic products, powders and syrups? Do I need to make raw cacao bites with these products to be healthy? Eat what you want this Christmas. Eat without feeling guilty. Enjoy what you eat. What nutrition advice should you trust? First, fat is the enemy and low-fat is your friend, then sugar is the enemy and quinoa is your friend, then grains are the enemy and kale smoothies are your friend, then bacon becomes a superfood and then it gives you cancer… There’s the paleo diet, the 5:2 diet, calorie counting, clean eating, raw, vegan… In a world full of contradictory advice from a myriad of “experts”, how are we to know which advice to really follow? Another year done and dusted. This is what I took away from my second year of studying nutrition. Nutrition is definitely a science. 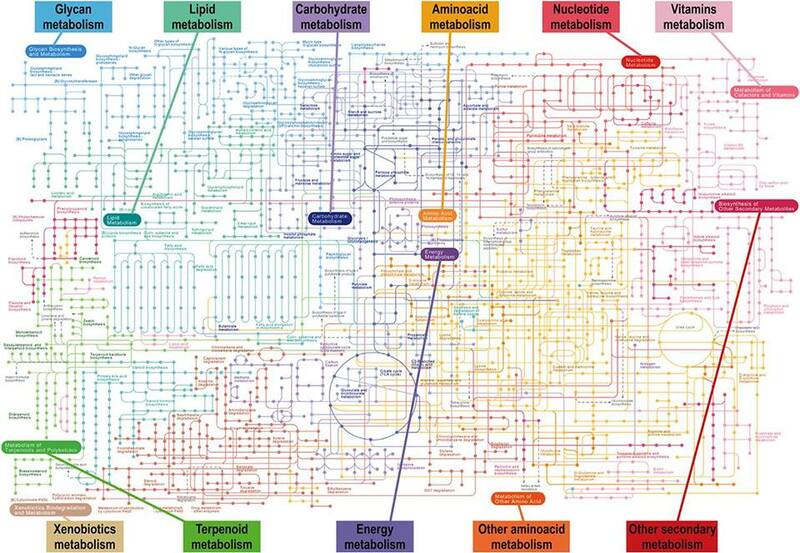 I had to learn some of this – every dot is a chemical name and every line in the name of an enzyme. Most nutrition students prefer the straight science subjects (biochemistry or physiology) as opposed to the nutrition subjects .